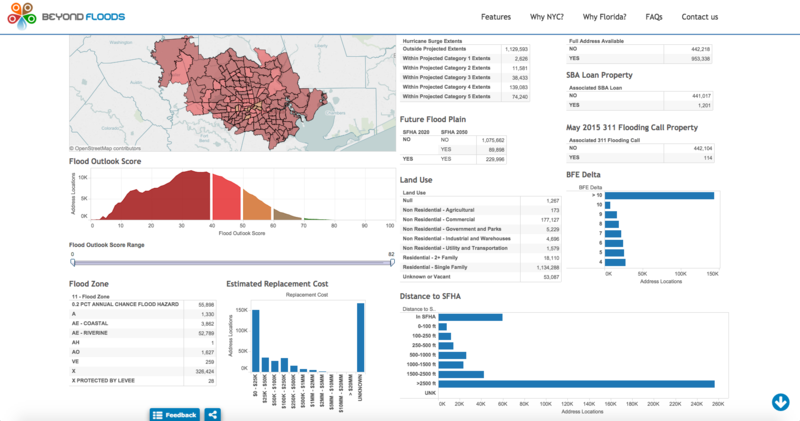 Beyond Floods provides organizations high resolution data and insights on flood risk, including steps to improve their portfolio’s resilience to flooding and climate change. A comprehensive evaluation of 25 flood factors, based on highly reliable publicly and private data sources from over 20 local, state and federal agencies. The Flood Outlook Score has twice the accuracy rate of FEMA floodplain maps in identifying areas of extreme and high risk, and can also identify risky properties outside the FEMA floodplains. Beyond Floods provides property structure level impacts of the floodplain regulatory boundaries and Base Flood Elevations, based on the current and upcoming FEMA regulatory maps. By interpreting best available topographic information including high resolution LiDAR data, Beyond Floods provides a solid baseline for first floor elevation determination which can be improved upon by the property owner or surveyor. Beyond Floods provides most accurate flood insurance premium estimations available in the market based on publicly available data. This service always uses the latest FEMA guidelines for flood insurance rating and allows users to modify parameters to improve the estimate. With our dynamic flood analytics services, Beyond Floods can evaluate the costs and benefits of various mitigation efforts at a property structure, neighborhood or community level, based on insurance premium impacts. Beyond Floods provides easy access to a user’s search results and favorites. The ability to generate a unique personal link for each property ensures that sharing information with friends, agents, or community members is streamlined and easy to accomplish. Beyond Floods brings your organizations efforts in flood risk mitigation and resiliency to the doorsteps of your stakeholders. We have integrated tools for accommodated several modern and traditional media for delivery of outreach messages. 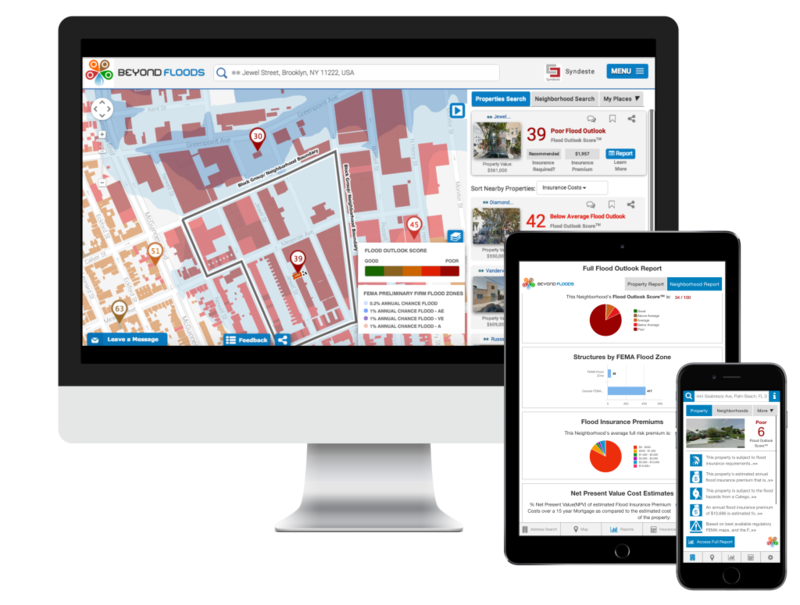 Download our free app and search our database of over 4 million residential and commercial properties in our showcase areas, for a comprehensive overview of property flood risk. We offer private and public organizations powerful tools and an effective channel for delivering flood mitigation solutions to their audience. Beyond Floods is available for all devices integrated with the cloud, for over 2300 counties in the contiguous US covering over 95% of the population. Contact us today to request a demo to see how we can help your organization.